See more objects with the color darkkhaki darkkhaki goldenrod indianred grey or see all the colors for this object. This is a Sidewall. It was manufactured by Thomas Strahan & Co., Manufactory. It is dated 1930 and we acquired it in 1971. Its medium is machine printed on paper. It is a part of the Wallcoverings department. The delightful tale of Alice in Wonderland as told by the renowned artist, illustrator and puppeteer Tony Sarg. The signs of this being produced during the Depression years, most notably the color bleed, do not detract from the charming and amusing illustrations. Alice became one of Sarg’s most popular marionette productions and it’s no wonder after seeing these captivating characters. 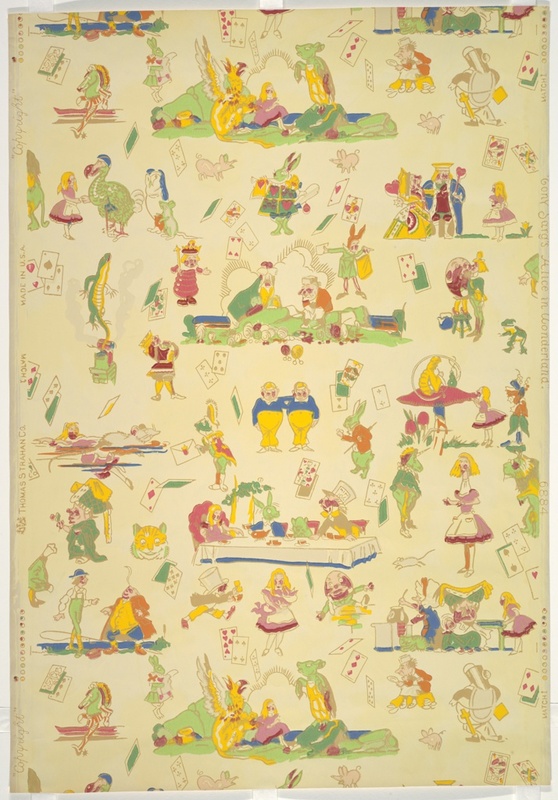 Printed in selvedge: "(thistle) Thomas Strahan Co. Made In USA Copyright Tony Sarg's "Alice in Wonderland." Pattern number 6884.